Chunky and creamy, our Velvety Mushroom Stroganoff works beautifully as a sauce for steaks or even pasta. With this soup, you can fix up a glorious dinner in minutes! Heat up the Velvety Mushroom Stroganoff soup till bubbling. Sprinkle salt and pepper on each side of the steak and pan-fry to the doneness desired. 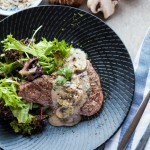 Serve with Velvety Mushroom Stroganoff sauce with salad or fries at the side.